For the Right, one might disagree with Oswald Spengler, but one cannot ignore him. Of course, for the Left and orthodox academia, the simplistic option is to ignore him. Spengler continues to pose a challenge, and his great questions of our epoch have yet to be fully answered. But it is essential that the questions are at least asked. One of the outstanding features of Spengler’s morphological theory of history is that it is unfolds before our eyes, at every moment. While saying something is “self-evident” might — and generally is — a method of claiming one is correct without recourse to evidence, I would challenge anyone who knows at least the fundamentals of Spengler’s cultural morphology to look around their own society, perhaps even their own immediate environs, and deny that Spengler is right. Oswald Spengler was born in Harz, Germany, on May 29, 1880, the only son and eldest of four children, from a paternal line of mine workers — although the father was a postal official when Oswald was born — and a mother with artistic abilities. Family life, however, was cold, and there seems to have been no deep bond of affection between the parents or towards the children. The father, Bernhard, was a loyal Prussian, but politics and reading were not part of the household. Young Oswald, however, at an early age devoured the literature of Goethe and Schiller, and later Shakespeare, Heinrich Heine, and Dostoevsky. In 1890, the family moved to the university city of Halle, where Oswald received a classical education, studying Latin, Greek, mathematics, and the natural sciences. From is mother’s side, he developed an affinity for the arts, particularly drama, poetry, and music. The eclecticism of those academic pursuits would provide the background that Spengler could bring to his magnum opus, The Decline of the West. Even as a 14-year-old, while writing plays, stories, and poems, Spengler was starting to think about the great issues to which he would devote himself in later years. Hence, in 1894 he wrote an essay entitled ‘Greater Germany: New Order in Europe and the Rest of the World’. He taught mathematics, physical sciences, history, and German literature at Saarbrücken, Düsseldorf, and Hamburg. He was a good teacher, whose style, according to former students, was both lively and “intuitive,” and he was already attacking Darwinism. However, in 1910, coming into an inheritance from his mother, he left the profession and started his life as an independent scholar, settling in Munich in 1911. Despite wartime hardships, by 1917 the first volume of his philosophical masterpiece, Form and Actuality, was ready, and was published the following year. The volume was an immediate success. To the defeated Germans, The Decline of the West put their predicament into world-historical context, and also offered a vision for the future of Western civilization as a unified cultural organism. So with such promise, a second, revised edition of The Decline of the West, Volume One, was published in 1922, soon followed by the second volume, Perspectives of World-History. Despite the professional critics, there were scholars of note who immediately spoke in favor of Spengler. His English translator, Charles Francis Atkinson, writing in the Translator’s Preface for the 1926 English edition of The Decline of the West, refers to an article by Dr. Eduard Meyer, a scholar of ancient history of worldwide repute, in Deutsche Literaturzeitung in 1924 in which Meyer, in contrast to what Atkinson calls “the first burst of criticism,” “insists upon the fruitfulness of certain of Spengler’s ideas.” The two remained friends until Meyer’s death in 1930. Spengler also maintained an exchange of ideas with many other scholars in the study of civilizations. Hans Erich Stier, Professor of Ancient History, assured Spengler that, despite “the original perplexity,” his thought has “exerted a great influence everywhere,” and was being imitated widely by historical scholars. Despite Spengler’s persistent ill-health and long periods of scholarly solitude, he sought to directly influence political events. Despite the criticism of “pessimism” or “fatalism” that continues to be leveled at Spengler, he did not see this in his historical morphology, and one might say that because all mortals are fated to die, one might as well give up without living whatever life’s course one might unfold. So it is with Cultures, according to Spengler. And the scholar sought to influence events politically. It was from Germany, re-imbued with the Prussian élan, from which the 20th century revival of Western civilization had to proceed in answer to English political-economics. However, Spengler was not an agitator, an organizer, or a man of party politics and mass movements. He sought to influence those who might take Germany, and thereby The West, into new directions. Over the period 1914 to 1917, while engaged in writing The Decline, Spengler also continued to write other material of a historical-political nature, including an essay, “To the German Nobility,” calling for a monarchist regime and a system of government that would raise a meritocracy, while eschewing parliament as the means by which the newspaper-reading public believes that it is politically empowered. Despite the initial difficulty in finding a publisher, the defeat of Germany garnered The Decline of the West much interest in the aftermath of the war, and Spengler suddenly became a widely respected philosopher, receiving the Nietzsche Archives Award in 1919. That year he gave a speech entitled “Prussianism and Socialism,” which was published as a pamphlet under that title, extolling the Prussian ethos of duty to the state as a true form of anti-capitalist “socialism,” not only Prussian, but now required for a universal Western resurgence. This Prussian ethical socialism, or what we might call Duty, Spengler contrasted with Marxian “socialism,” which is nothing other than a mirror image of English economics, aiming to replace one ownership class with another, while maintaining the same 19th century Zeitgeist of money-thinking. Spengler’s thinking had a major influence on Otto and Gregor Strasser, luminaries of the North German region of the Nazi party, and while Otto soon went his own way, Gregor, whom Spengler greatly respected, unsuccessfully sought Spengler’s support for the NSDAP. With Spengler’s rejection of party politicking, demagoguery, and mass movements, and his cultivation of those already in positions of influence or potentially so, within industry, politics, and academia, it is apparent that what Spengler was aiming for was a “revolution from above,” a shift of perception within ruling circles. During the 1920s Spengler was widely sought as a lecturer. In 1921 he read a paper on “Philosophical Considerations on the Economy,” organized by his close collaborator and friend, the influential industrialist Paul Reusch, head of Gutehoffnungshütte (Good Hope Mill), a leading mining and engineering firm in the Ruhr, and of the German Chamber of Commerce. In 1927 Reusch founded the Ruhrlade, a covert society, which raised money for conservative parties and sought their unification. In 1922 Crown Prince William wrote to Spengler in appreciation for the second volume of The Decline of The West, which he was “studying with the greatest interest.” Spengler’s ideas seem to have been of much interest among the deposed Royal Family, and in 1925, for example, the Kaiserine Hermine asked if she could meet Spengler. He had visited Crown Prince William in Holland in 1923. Spengler was of course greatly interested in the Hitler case being heard in Munich, his city of residence, in February 1924. He commented to his sister, Hilde Kornhardt, that Ludendorff had “frustrated the arrangements made to prevent secret matters coming out in court,” in regard to the broader Rightist connections of the NSDAP. Another concern was Ludendorff’s anti-Church stance which was alienating Catholics from the Right. A luminary of the Right much interested in Spengler’s views was the industrialist Alfred Hugenberg, leader of the German National People’s Party. Other important contacts included Seldte, founder of the Stahlhelm paramilitary veterans movement, and the widely read Conservative Revolutionary novelist Ernst Jünger. In April 1925, Benito Mussolini wrote thanking Spengler for his “The State,” “The Economy,” “Reconstruction of the German Reich” and “Political Duties of German Youth,” which the Duce assured Spengler he would read “with great pleasure.” Since 1923, Spengler had noted Mussolini’s opposition to French foreign policy, and sought contact with Italian governmental circles. Spengler’s view of Mussolini seems ambivalent, however, writing to his sister Hilde Kornhardt, while on holiday in Rome in 1929, of Mussolini as the “woolly lamb” who “suns himself in the luster of beautiful speeches [while] in the background everybody curses.” This seems to have reflected Spengler’s distrust of mass movements, including those on the Right, with the flags, slogans, and parades that he had criticized in regard to the Nazis. The last man of the world city no longer wants to live — he may cling to life as an individual, but as a type, as an aggregate, no, for it is a characteristic of this collective existence that it eliminates the terror of death. That which strikes the true peasant with a deep and inexplicable fear, the notion that the family and the name may be extinguished, has now lost its meaning. The continuance of the blood-relationship in the visible world is no longer a duty of the blood, and the destiny of being the last of the line is no longer felt as a doom . . . The peasant is rooted to the soil as a “descendent of his forebears and as the forbear of future descendants.” For the “last men,” “all this is past and gone.” This primeval urge to family-continuity is as strong in the aristocracy as in the peasant, we might add, and Spengler notes that “the prudent limitation of life” was deplored by the more far-sighted of Rome’s thinkers and statesmen, who sought vainly to revert the process. It is the present population decline of the West that signals more than any other single factor Spengler’s morphology unfolding before us. It is to this depopulation that Mussolini addressed himself, a primary influence on Fascist population doctrine being Dr. Richard Korherr. An expert on population statistics, Korherr is remembered today as the “infamous” author of the Korherr Report (1943) on the Jewish populations of Europe, prepared for the SS in his capacity as Inspector of Statistics. We might better appreciate him however as an expert on population decline, who was never a Nazi. The report shows that European Jewry had long undergone a natural population decline, although any such statistics are now interpreted as evidence for genocide. However, Korherr could not be found guilty of any crime even by the post-1945 mass lynching party, and he pursued an academic career in post-War Germany, dying in 1989. Like Spengler, Korherr sought analogies in other civilizations and found that Confucius gave China the ethos that “the man who dies without descendants receives no social recognition among the living.” Western civilization therefore needed a “western Confucius.” Korherr regarded Spengler as that individual, and anyone lesser as only causing harm. In 1928, the year of his employment with the Bureau of Statistics, Korherr’s work drew the attention of the Italians and he met the Italian General Consul in Munich. Mussolini wished to personally translate Korherr’s Birth Decline, adding his important May 1927 “Ascension Day” speech “Numero come forza” (“Strength in Numbers”) as a Preface, along with an uncharacteristic Preface by Spengler, indicating the importance Spengler attached to Korherr’s work. The Italian edition is Regresso delle nascite. All attempts to gather up the content of the future into parties will soon be forgotten. The Fascist formations of this decade will pass into new, unforeseeable forms, and even present-day nationalism will disappear. There remains as a formative power only the warlike, “Prussian” spirit — everywhere and not in Germany alone. Destiny, once compacted into meaningful forms and great traditions, will now proceed to make history in terms of formless individual powers. Caesar’s legions are returning to consciousness. During the mid- to late-1920s, demand for Spengler as a lecturer remained high, including an invitation to attend the International Philosophical Congress at Cambridge, Massachusetts in September 1926, which he was unable to attend due to financial reasons and pressure of writing. On 17 July 1927 Spengler suffered a cerebral hemorrhage, which caused continuous ill-health until his death nine years later. He did, however, continue to lecture and to travel about Europe. Despite the lasting effects of his stroke, Spengler managed to write two major works in the 1930s. Man and Technics, published in 1931, foresaw the usurpation of Western technology — a creation of the Faustian soul — by the “colored world,” which would be used in its revolt against the West. The year 1932 brought new opportunities for the destruction of the Weimar Republic. The future was being fought out between Communists, Conservative traditionalists, and the National Socialists. Spengler had always seen the nationalist Right as lacking, hence he urged the formation of a new national party as early as 1923. His opinion of the Italian Fascists and particularly of Mussolini was altogether more positive, seeing them achieving results. His ideas on race in The Decline and elsewhere are antithetical to Nazi zoological conceptions but were closer to those of Italian Fascism. During this first year of Nazi rule, when conservatives were still in positions of influence, the Conservative-Right was attempting to direct the course of events. 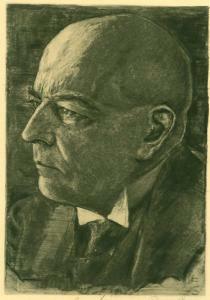 Spengler was at the center of such moves, and had written to Roderick Schlubach in April that he urgently desired to “discuss the new situation,” as “great possibilities” were representing themselves, but the Nazis were not the men to “grasp and deal with them.” However, many of these Nationalist-conservatives, including Hartnacke, were out of power once the Nazis had consolidated their rule, and Hartnacke, for example, ended up as a High School teacher from 1935. I shall neither scold nor flatter. I refrain from forming any estimate of those things which are only just coming into being. True valuation of any event is only possible when it has become the remote past, and the definitive good or bad results have long been facts: which is to say, when some decades have passed.. The Hour of Decision was a great success, and Nazi press attacks only served to increase sales. After 150,000 copies were in print, the Nazis forbade mention of Spengler’s name and attempted to suppress the book. While the measures took effect, the thousands of copies already in circulation exchanged hands, keeping the circulation surreptitiously high. The Hour of Decision was intended to influence the course of events, and a copy was sent to Hitler in August, Spengler suggesting a meeting with him to discuss the work. While others saw The Hour of Decision for what it was, and were not at all optimistic about the Hitler regime, some Nazi efforts were still made to win Spengler over. Goebbels tried to persuade Spengler to write for the National Socialist press, Spengler declined any such overtures. For the next three years Spengler was left alone by the regime, but could not publish an intended second volume of The Hour of Decision, and could only prepare notes in the hope that one day he could again be published. In late 1935 he resigned from his long association with the Nietzsche Archive, protesting that Elizabeth Föster-Nietzsche’s had made the Archive an instrument of the regime. Strong and unspent races are not pacifistic. To adopt such a position is to abandon the future, for the pacifist ideal is a static, terminal condition that is contrary to the basic facts of existence. Should, the white peoples ever succumb to pacifism they will inevitably fall to the colored world, just as Rome succumbed to the Teutons. In the early morning of 8 May 1936 Spengler died of a heart attack at his Munich apartment. His sisters buried him quietly, with the request that there be no expressions of sympathy. Spengler was buried holding copies of Nietzsche’s Thus Spoke Zarathustra and Goethe’s Faust. His grave is marked with a block of polished black granite, chosen by Paul Reusch, inscribed in white with “Spengler”: austere, solid, enduring . . .
6. Oswald Spengler, The Decline of the West, trans. Charles Francis Atkinson (London: George Allen & Unwin, 1971), vol. 1, xiv. 8. Henry Stuart Hughes, Oswald Spengler: A Critical Estimate (New Brunswick, N.J.: Transaction Books, 1992), p. 4. 9. Hughes, Oswald Spengler, p. 5. 14. Charles Francis Atkinson, Translator’s Preface, The Decline of the West, vol. 1, x. 15. Hans Erich Stier to Spengler, May 16, 1926, in Oswald Spengler, Spengler Letters, ed. and trans. Arthur Helps (London: George Allen and Unwin, 1966), pp. 199–200. 18. Oswald Spengler, Prussianism and Socialism (Paraparaumu Beach, New Zealand: Renaissance Press, 2005), Introduction, p. 4. 19. The Decline of The West, vol. 2, p. 506. 20. Gregor Strasser to Spengler, June 2, 1925, Spengler Letters, p. 181; Gregor Strasser to Spengler, July 8, 1925, Spengler Letters, p. 183. 22. Crown Prince William to Spengler, June 1922, Spengler Letters, p. 110. 23. Klara von Leipzig to Spengler, July 15, 1925, Spengler Letters, p. 191. 24. Hughes, Oswald Spengler, p. 117. 25. Spengler to Gerhard von Janson, October 5, 1923, Spengler Letters, pp. 134–35. 26. Spengler to Reinhold Quartz, October 30, 1923, Spengler Letters, pp. 139–40. 27. Spengler to Nicholaus Crossman, December 1, 1923, Spengler Letters, pp. 144–45. 28. Engelbrecht von Kerkerink zu Borg to Spengler, Spring 1924, Spengler Letters, p. 150. 29. Mussolini to Spengler, April 24, 1925, Spengler Letters, p. 180. 30. Spengler to Paul Reusch, June 9, 1923, Spengler Letters, pp. 123–24. 31. Winifred Wagner to Spengler, June 6, 1929, Spengler Letters, p. 245. 32. The Decline of the West, vol. 2, pp. 103–04. 33. The Decline of the West, vol. 2, pp. 103–04. 35. Korherr to Spengler, October 21, 1926, Spengler Letters, p. 203. 36. Spengler to Korherr, October 28, 1926, Spengler Letters, p. 203. 37. The Decline of the West, vol. 2, p. 105. 38. Korherr to Spengler, May 30, 1927, Spengler Letters, pp. 219–20. 39. Korherr to Spengler, March 2, 1928, Spengler Letters, p. 233. 40. Carl Ipsen, Dictating Demography: The Problem of Population in Fascist Italy (Cambridge: Cambridge University Press, 2002), p. 66. 41. The Decline of the West, vol. 2, p. 506. 42. Oswald Spengler, The Hour of Decision, Part One: Germany and World-Historical Evolution, trans. Charles Francis Atkinson (New York: Knopf, 1934), p. 230. 43. Oscar von Müller to Spengler, March 13, 1931, Spengler Letters, p. 254. 44. R. Schlubach to Spengler, December 6, 1929, Spengler Letters, pp. 248–49. 45. Spengler to Schlubach, Spengler Letters, January 12, 1930, p. 250. 46. Oswald Spengler, Man and Technics: A Contribution to a Philosophy of Life, trans. Charles Francis Atkinson (London: European Books Society, 1992). 47. Albert Schweitzer to Spengler, November 28, 1932, Spengler Letters, p. 273. 48. Rupprecht to Spengler, November 29, 1932, p. 274. 49. Hughes, Oswald Spengler, p. 123. 51. Spengler to André Fauconnet, March 15, 1927, Spengler Letters, p. 217. 52. Hans Freyer to Spengler, June 15, 1933, Spengler Letters, p. 281. 53. Spengler to Wilhelm Hartnacke, June 24, 1933, Spengler Letters, p. 281. 54. Hartnacke to Spengler, July 1, 1933, Spengler Letters, p. 282. 55. Spengler to Schlubach, April 18, 1933, Spengler Letters, p. 280. 56. The Hour of Decision, p. ix. 57. The Hour of Decision, p. x. 58. The Hour of Decision, p. 7. 59. Hughes, Oswald Spengler, p. 131. 60. Spengler to Hitler, August 18, 1933, Spengler Letters, p. 284. 61. Goebbels to Spengler, October 20, 1933, Spengler Letters, p. 289. 62. Spengler to Goebbels, November 3, 1933, Spengler Letters, p. 290. 63. Elizabeth Förster-Nietzsche to Spengler, October 15, 1935, Spengler Letters, pp. 304–305. 65. Hughes, Oswald Spengler, p. 136.